Flying is stressful enough without having to worry about whether your checked luggage will turn up on the carousel once you reach your destination. In a bid to improve its service and ensure your bags end up in the same place as you do, Delta earlier this year introduced Radio Frequency Identification (RFID) tracking tags for bags. The system helps the carrier accurately track passengers’ baggage as it makes its way through the airport, onto the plane and, hopefully, to the correct destination. The RFID system, which is more reliable than the current barcode-scanning system, is currently operational at 84 U.S. airports, with international locations coming soon. The bonus is that the system also offers the baggage data to passengers, sending push notifications as to its whereabouts via the airline’s Fly Delta smartphone app. 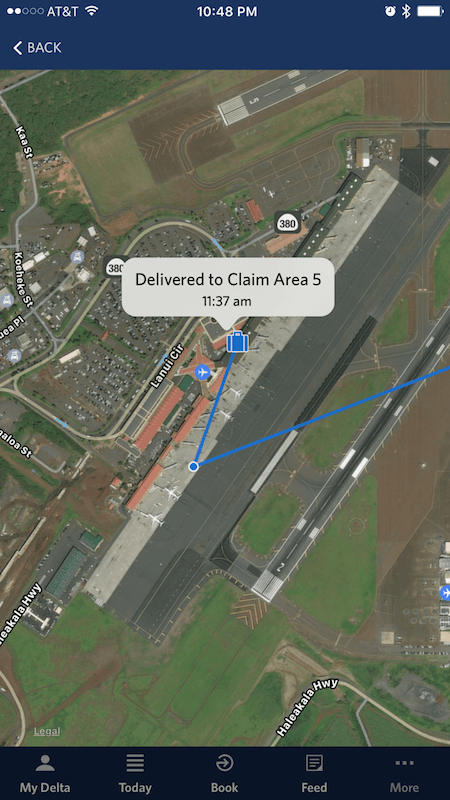 Building on the service, Delta this week announced it’s adding real-time mapping information so you can check on the precise location of your checked luggage at all times. That’s right, you can track your bag on a map. So how does the new map functionality work? According to Delta, when one of its passengers wants to see the location of their luggage, they start by viewing a zoomed out map of the U.S. as the bag travels from one airport to the next. “The map then automatically zooms to ‘airport view’ and users can follow their bag along its journey via pins, with the last known location identified by a suitcase icon. Tapping any of the pins or the icon will provide additional text information about the location of the bag,” the airline explained. While it may provide peace of mind for some travelers, the feature could end up adding more stress to the journey for others. After all, what if it looks like your bag is heading to the wrong aircraft, but you can’t be sure? What if you find yourself obsessively watching the progression of your suitcase on its journey to your plane instead of enjoying a good read or simply chilling out in the departure lounge? And what if you think your bag isn’t on your plane – though you’re not sure – as it leaves the gate, leaving you on edge for the entire journey? All passengers want is for their bags to turn up at the correct destination without having to fret about it, and without having to monitor it for themselves. The new mapping feature is a good idea, but is it a great idea? Sound off in the comments below.